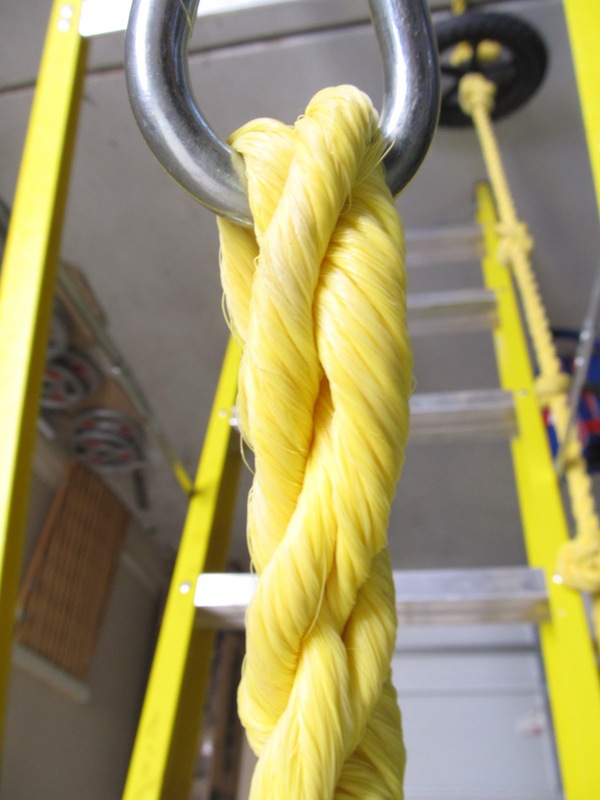 Climbing ropes are one of those pieces of equipment you can’t take any chances with. But with new ropes costing upwards of $120 + shippnig, I knew I had to find a way to make a homemade climbing rope for a lot less money. Special thanks to the Home Depot guy who showed me how to braid the rope. 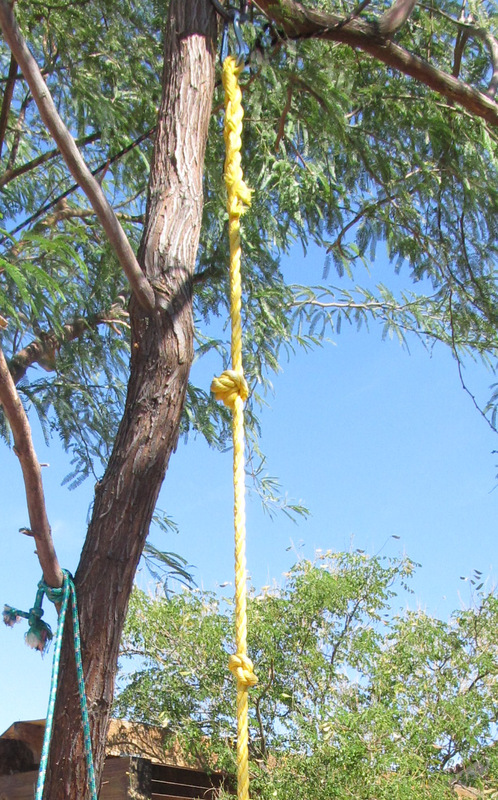 I was able to set up a strong rope swing/slash climbing rope on the tree ni my backyard. The cost? About $20 bucks for the rope, and nothing for the two carabineers I already had on hand, which would have cost another $12-15 dollars. At the time I was thinking more kid’s rope swing then climbing rope. It was only after I had tied the knots in the rope that I realized I could climb it. 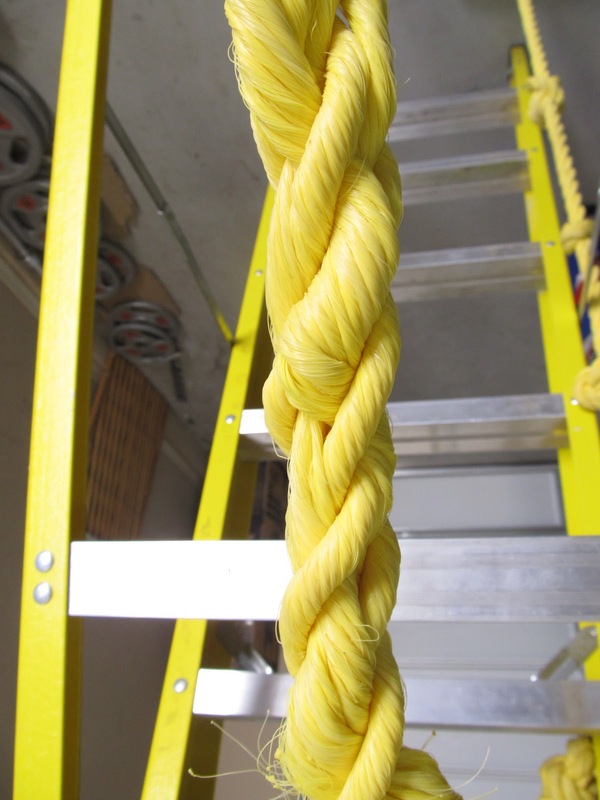 -15-20′ feet of 3/4″ inch thick rope. 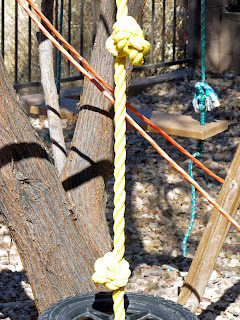 (I used the poly rope as you can see. Confession, I bought it because it was cheap and strong, but it worked out fine and has tight knots. -Carabineers to attach braided rope loop through and then to hang from fixed anchor. Here is a close up of the braiding. See the tire hanging over the other end of the ladder? This is an old stroller tire I had in the garage. It was a perfect fit. Another view of the braid. 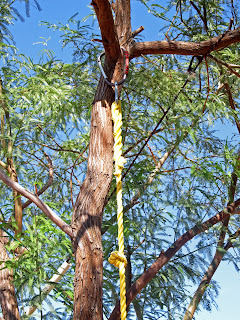 All in all this has climbing rope/rope swing has taken a beating, been swung on by big kids, climbed on by me and lasted throughout an Arizona summer. I’ve moved it to the garage now. Sooner or later the sun out here will disintegrate those fibers! But for about $20 bucks it has more than proved its value. 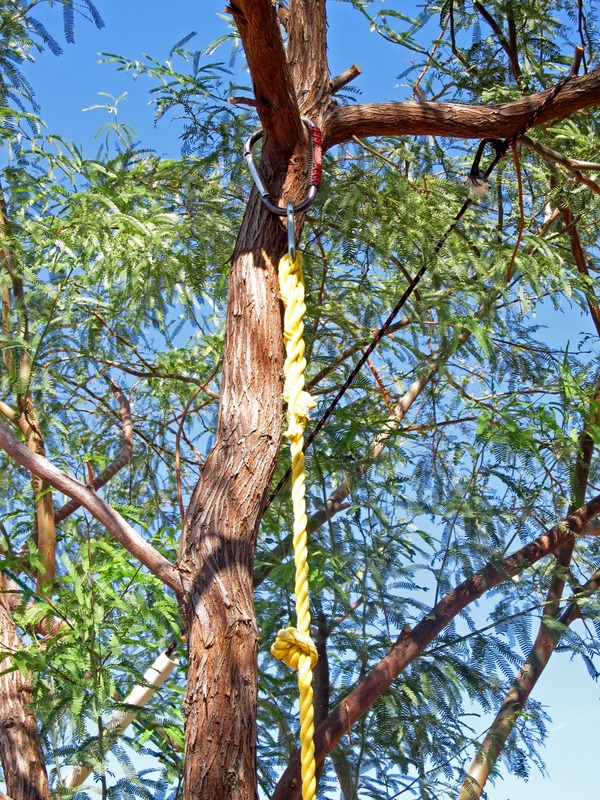 A word of caution: Although the weight bearing load listed for this rope is over a thousand pounds, you should always check and double check the knots and anchor point, especially if this is doubling as a rope swing. While my experience has been excellent with this homemade climbing rope, I make no guarantees and anyone trying this does so at their own risk. On that note, be safe and have fun!!! The Spartacus Workout is here! Steve Maxwell has put together another amazing advanced training DVD. Check out The Spartacus Workout today.